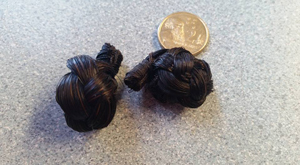 Champion Tails False Mane Plaits come in 3 different sizes, small (the size of a $2.00 coin) Medium, (the size of a 10c coin) Large, (the size of a 20c coin). We colour match at no extra charge. Instructions are easy: grab your wisp of mane and band it. Turn it into it self then add the false plait and sew.